The process in 4 easy steps. So they're finally making The Movie of your favorite franchise (probably from The Eighties). And you hate it. They're doing the casting wrong, they have the wrong director, they're ruining your childhood and so on. And then they bring out the one thing that makes you go, "Holy crap, this is going to be awesome." The reasons for this can vary depending on the individual production and the individual fan. It seems that the most common instance of this happening is getting someone involved with the original to come back either in a major role or at least give their approval of the new direction. Other instances can be an actor or director proving themselves as a Promoted Fanboy, a demonstration of costumes or set design or a petition for a certain actor/actress and actually get them. As a side note, this is a term describing a reaction. In a surprising inversion of Sturgeon's Law, most of the time this is a very good omen as to the quality of the production. But there are always those productions that screw it up even after such a moment. That is not this trope; see They Wasted a Perfectly Good Plot, One-Scene Wonder and Adaptation Decay for more on that. A Big Yes, a Squee, and/or something similar will be shouted by fans when these moments occur. 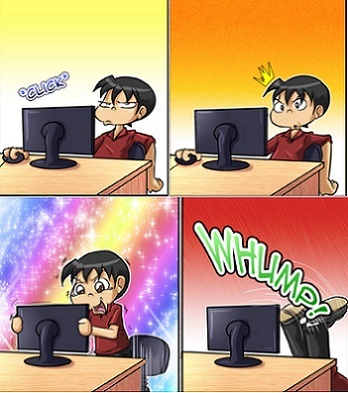 Across the internet, the Memetic Mutation "Reaction Guys / Gaijin 4Koma" is sometimes used to convey these reactions. Contrast Tainted by the Preview and Ruined FOREVER. Related to Pandering to the Base, although that doesn't always get this result. Not to be confused with And There Was Much Rejoicing, unless a Scrappy is involved. This page was last edited on 18 July 2017, at 03:07.